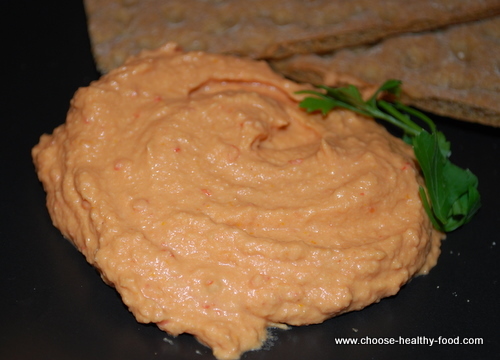 Want to make a delicious roasted red pepper hummus in less than three minutes? A recipe that I am about to share with you is so easy, it feels like cheating. Not only it is delicious, it contains 30-50% less calories from fat than your typical commercial hummus ( such as Costco sabra hummus, for example). It takes time to bake roasted red peppers in the oven, as an authentic hummus recipe would require. I used marinated roasted red peppers instead, along with sun dried tomatoes in oil. Hummus can use a bit of extra flavor, and marinated red peppers lend it to it nicely. Yes, I used chickpeas from the can. Look for the ingredients listed on that can when you buy it. I found that company named CHIC doesnt add disodium EDTA to their canned beans, just water and salt, therefore I can recommend it. This component is used to preserve the color of beans. Although it is considered harmless, why take it in if you can leave it out. Dont feel guilty for doing this! Some people would say that aluminum from the can leaks into water and beans, and that it is much healthier to cook those chickpeas from scratch. Its true, but lets be realistic for a moment. What choices do you have when in the hurry? Dont make or buy hummus, eat something else instead. Compared to this hearty homemade hummus, most of commercial products are more expensive, higher in calories, and have a long list of additives, responsible for better taste and preservation. If your best alternative is to buy or not to eat hummus at all, I dare to suggest that making your own hummus with canned beans is a better deal for your health. There are a lot of vitamins, minerals, and fiber in your hummus. There is that sense of pride for making your own delicious meal, too. 1 tsp of any omega-3 oil ( hemp or flaxseed oil) - completely optional: you have to eat uncooked omega-3 oils every day - why not in hummus? Place all ingredients ( chickpeas and sun-dried tomatoes first) in the food processor. Process until smooth. If you like it chunky, make sure not to overprocess. Put into a dish, sprinkle with paprika,garnish with cilantro or parsley, and serve. Bon appetite! Did not I tell you it was easy and quick?